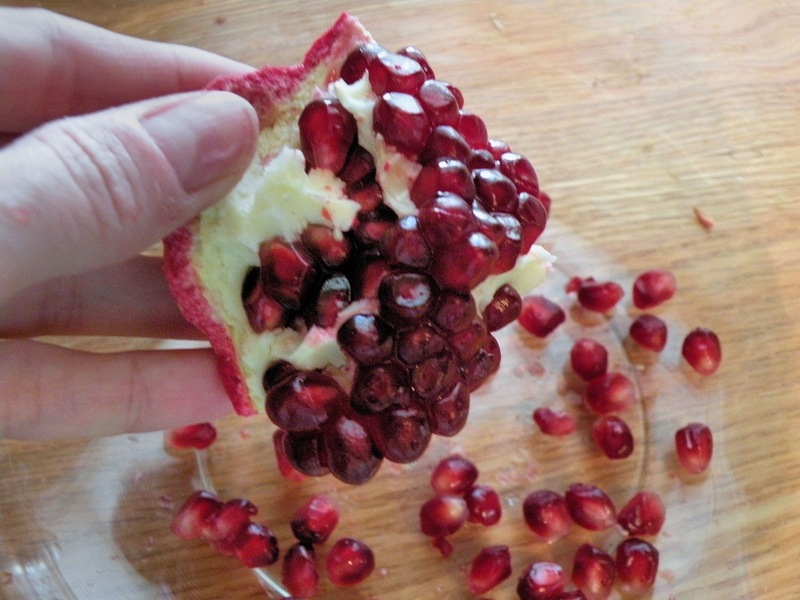 Pomegranates are in season! These super sweet fruits are in season roughly the end of October through the beginning of November. These fruits are not only delicious, but they have super health benefits too! 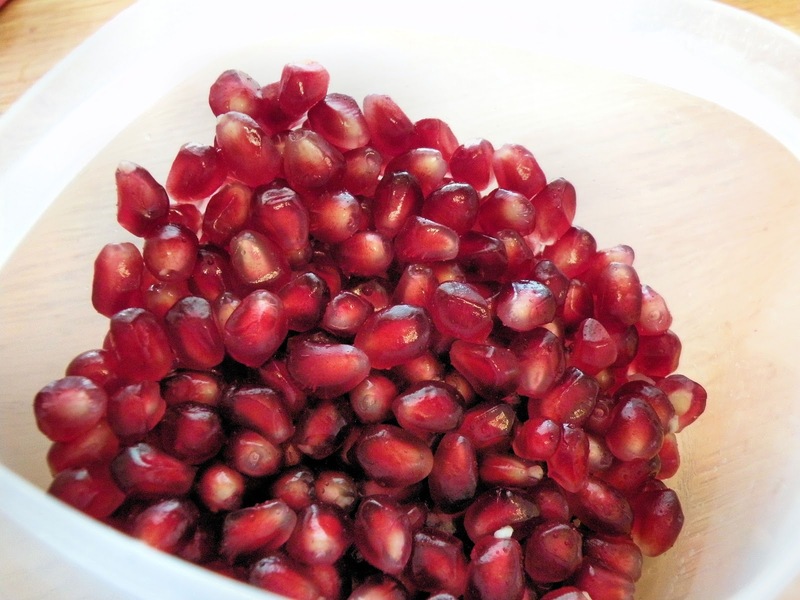 They are packed with antioxidants, various vitamins and folic acid. Research has also shown the potential to combat certain cancers, arthritis, coronary disease, Alzheimer's and other aging ailments. So, what the heck do you do with them? Looking at a pomegranate, I can't help feeling a bit perplexed. Have you wondered, too, how to use this fruit? Here is some help! 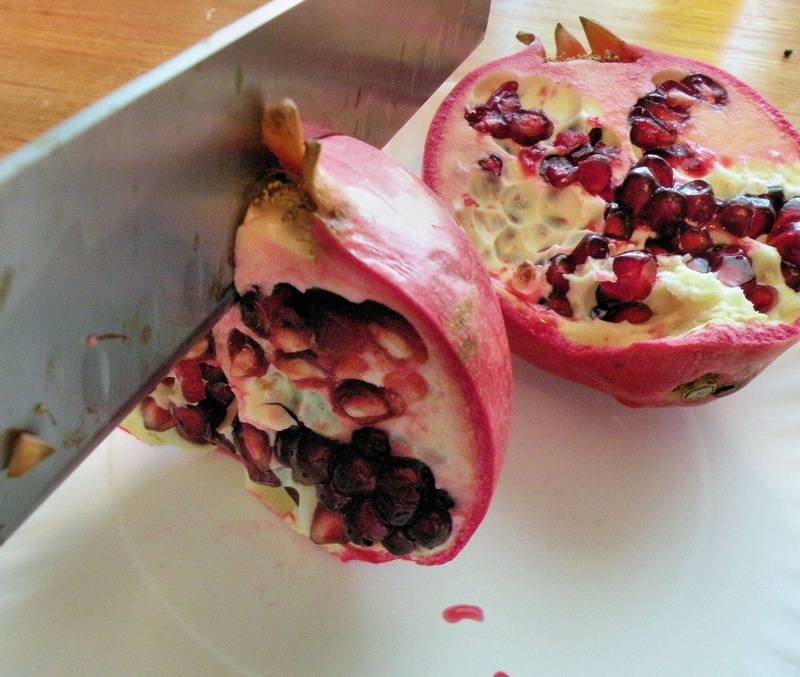 Preparing a pomegranate can be a bit messy. It's dark red-purple juice will stain anything it touches. I used a paper plate to cut mine. The juices pooled toward the center of the plate. You may want to wear an old t-shirt in case you get spattered ... I did! 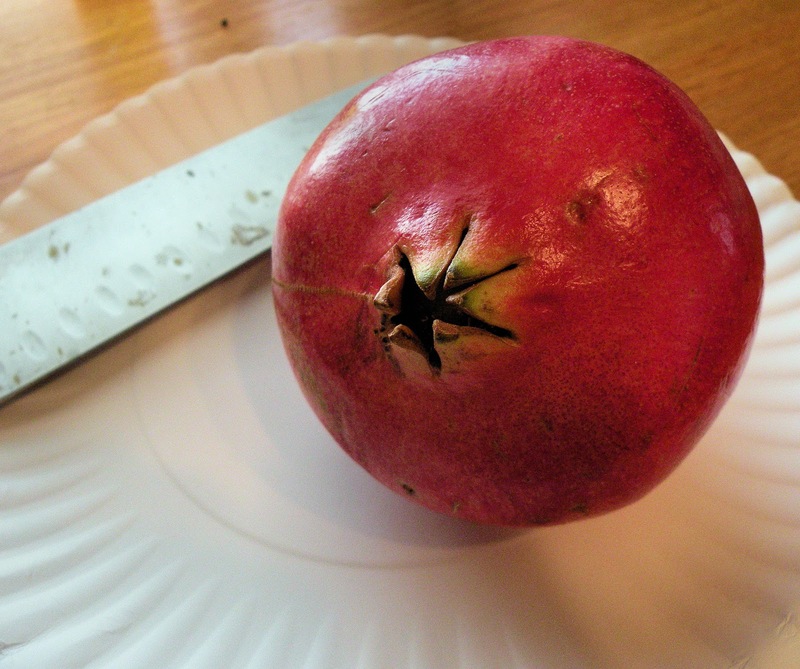 Cut into the crown of the fruit with a large knife. There is a thick chunk of membrane that you will be cutting into. Cut down about 1 to 2 inches. 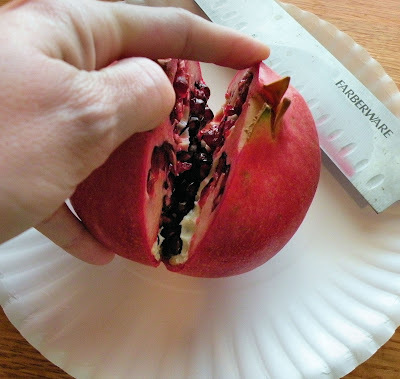 If you cut down any further you will slice open the seeds ... You just need a slit that you can get your fingers into to break it open. Work your fingers into the cut and gently break it open. Follow the same process on each half, breaking the fruit into quarters. 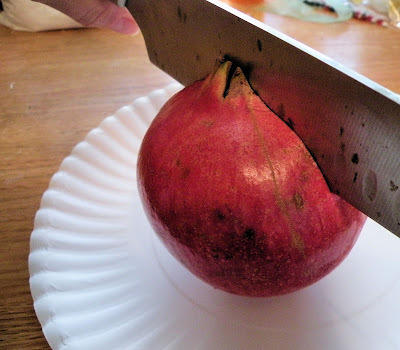 Gently break the seeds away from the membrane over a large bowl. 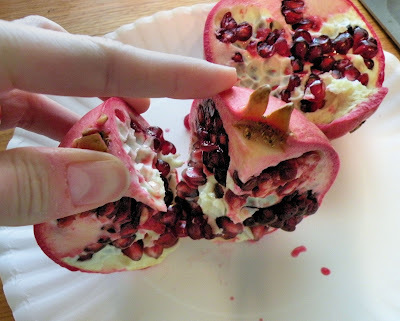 One fruit will yield a generous amount of seeds. Finally, gently rinse the seeds in cool water to remove any membrane that is stuck to them. Store in an air-tight container in the refrigerator for 2 to 3 days. So, now what? Well, the seeds are super yummy to munch on just the way they are. Also, try sprinkling them over a salad, pancakes or waffles or frozen yogurt ... get creative! Want juice? Personally, I would recommend buying it by the bottle, but if you really want to make your own ... it will take about 2 pomegranates to yield one cup of juice. Give the seeds a quick pulse in a food processor and then press through a sieve. Though I haven't tested it, I have also read that you can freeze the seeds by spreading them in a single layer on a sheet pan until frozen and then placing them in a freezer bag.